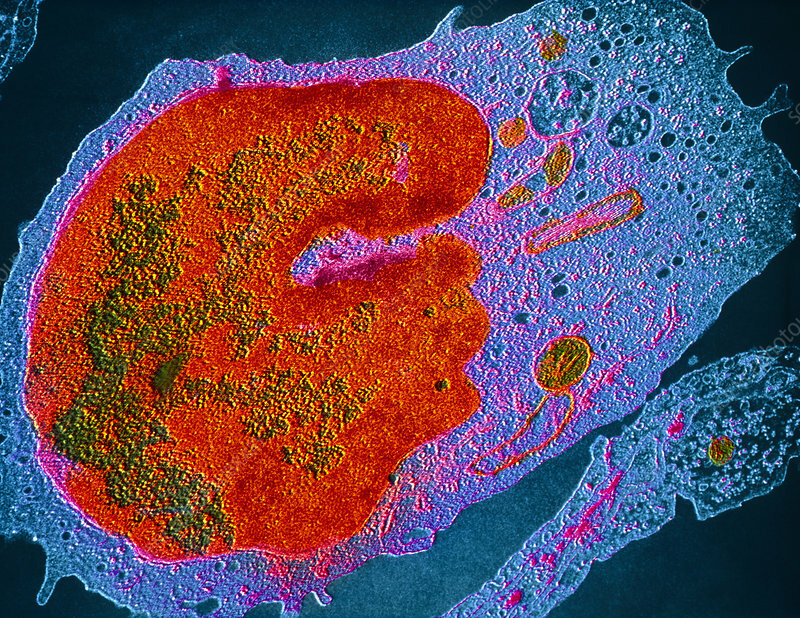 False-colour transmission electron micrograph (TEM) of a human monocyte, a type of white blood cell. Monocytes appear to have little function in blood, but are highly mobile & migrate into tissues where they are known as macrophages. In addition to scavenging & engulfing (phagocytosing) cellular debris & microorganisms, a macrophage is capable of processing antigenic (foreign) substances during the initial phase of immune response. Processed antigens are presented on the macrophage's surface for recognition & elimination by other white cells. Magnification: x12,150 at 6x7cm size, x5,400 at 35mm size.